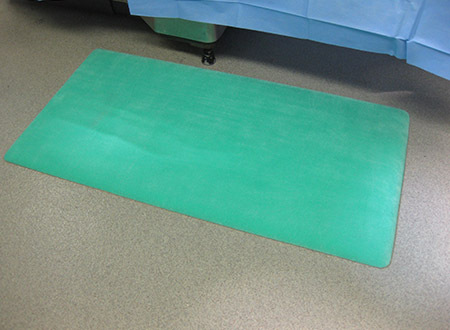 "Going Green in our OR has a whole new meaning since we began using Flagship's Smooth Mats. Thank you for filling a big need here overseas!" This economical and ergonomic surgical mat features Flagship's patented anti-fatigue properties, and is designed for use in the operating room for longer, "dry" surgical procedures. The Smooth Mat™ works to eliminate the exhaustive pain and discomfort from standing for extended periods of time in any OR environment. With amazing comfort, added safety, and single-use efficiency, The Smooth Mat is a dream come true for progressive surgical facilities.